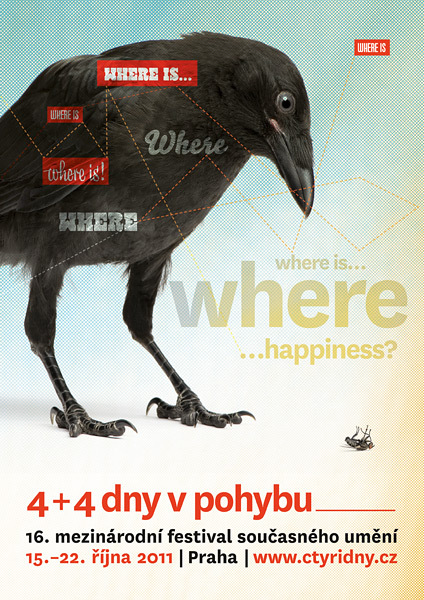 The equation 4+4=8 is more than just a basic part of the primary school curriculum – in mid-October, these numbers will invite all fans of unusual cultural events to explore the 4+4 Days in Motion festival = 8 days during which conventional and unconventional venues in Prague come to life with innovative, progressive, and often provocative artistic projects – theater and dance performances, concerts, exhibits, film screenings, and video art. All these events have one thing in common: they will pull you out of your everyday routine and bring you closer to the latest interesting developments in contemporary art, both in the Czech Republic and abroad. The festival does not limit itself to traditional venues, but uses art to bring to life unused or neglected buildings in Prague. Over its fifteen-year history, the festival – which has earned great esteem both at home and abroad – has presented more than 160 artistic ensembles from 25 countries. The festival has also contributed to many projects in terms of both dramaturgy and production. This year’s guests include Norway’s Jo Strømgren Kompani; a project by Brazilian actor, director, and producer Joelson Gusson entitled Cyborg Manifesto; “Before Your Very Eyes,” a performance with children for adults by the British- German Gob Squad ensemble and Belgium’s Campo Theater; “Haircuts By Children,” a project by Canada’s Mammalian Diving Reflex; Germany’s Invisible Playground ensemble with their site-specific play “Field Office;” and “Ökö” by Slovakian and Swiss’s T-d’U. The festival will also feature the Czech premiere of “Not Made For Flying,” the latest dance performance by the Czech-Italian ensemble DEJA DONNE. Other premieres include works by directors Jiří Havelka and Jiří Adámek, choreographer Veronika Švábová, and the NANOHACH dance ensemble. “Places of Act” is a long-term international project by the Four Days association that aims to revitalize public space through art. Places of Act will attempt to take a new look at places deserving of our attention, care, and protection. In past years, such buildings have included the former Federal Assembly building, the empty dental polyclinic on Jungmannova Street, and the Šlechta Restaurant. Over its 16-year history, Four Days has used art events to introduce the public to more than thirty unconventional venues. The former Center for Folk Art Production (ÚLUV) and Prague’s Vršovice district are the Places of Act for the year 2011. Last year’s dramatic concept for the ÚLUV building focused primarily on the architecture and history of this functionalist jewel on Národní třída, which has somewhat unfortunately been hidden under layers of advertising and billboards for many years. The building itself became an indoor stage for lectures, discussions and guided tours with interesting individuals one way or another associated with the building, while invited artists created a series of site-specific projects for the building’s shop windows on Národní třída. We plan to continue in this vein. The ÚLUV building (originally built in 1936 as the House of Applied Art for the Union of Czechoslovak Handicrafts) is an ideal exhibition space, theater, lecture hall, café, reading room, or dance space. Architect Oldřich Starý designed the building as a gallery and special events venue with a large cinema auditorium in the basement. Although we are already familiar with ÚLUV, we can use it to try out new things. For eight days, we aim to bring this abandoned building to life and integrate it into Prague’s art scene through exhibitions, performances, lectures, symposia, screenings, video-art installations, public happenings, variety evenings, concerts, and more. The picturesque district of old Vršovice is to become the second Place of Act this year. Our aim is to call attention to the small civic associations that are a vital force in creating a healthy city that is pleasant to live in. In this case, we have been working together with Start Vršovice, which has been focusing on issues of public space and social interaction in Vršovice for several years. In this way we hope to demonstrate that by caring for and acting in the interest of public urban space on the local and personal level, people can directly influence their quality of life and that of their neighbours. Some “places of act” have been a part of Vršovice tradition for a long time, but are nowadays at great risk of disappearing, such as the Waldes factory (Koh-i-noor) and the Bohemians 1905 stadium. Others are just emerging and waiting to be used, such as the ProLuka (EmptyLot) open-air gallery, located on an empty lot in Vršovice. Therefore, we wish all old and new places of act much luck.